MOSCOW, January 23. /TASS/. Russian President Vladimir Putin hopes that the Akkuyu nuclear power plant, which is now being built in Turkey with Russia’s assistance, will be launched in 2023. "The implementation of a large-scale project for the construction of the first nuclear power plant in Turkey, Akkuyu, is under way and complies with the schedule. 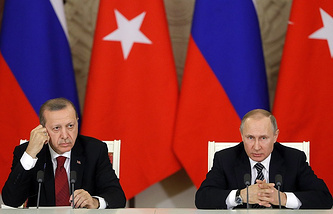 They are building its first power unit, which we plan to launch in 2023," the Russian leader said at a press conference following Russian-Turkish talks. According to Putin, this date was named by Turkish President Recep Tayyip Erdogan, since in 2023, the republic of Turkey will celebrate its centenary.